Don't already have enough screens in your home? Amazon is getting ready to release a new device that may help you solve that problem. Echo Show is a Wi-Fi connected home device with a 7" touchscreen and 5MP front-facing camera. The device, which comes in black and white options, is available for preorder now and slated to begin shipping on June 28. Naturally, it's the priciest of Amazon's Echo lineup at $229.99. In comparison, the Echo will set you back $179.99, and the Echo Dot is priced at just $49.99. Read on for everything you need to know about Echo Show, including its main features, requirements, and limitations. Amazon says Echo Show offers "everything you love about Alexa," its virtual assistant that also powers the Echo and Echo Dot, but with a new feature: the ability to show you things. When you're ready to use the device, just say the wake word "Alexa," followed by a command. You can say things like: "Play music for a dinner party," "Show me cooking videos on YouTube," "What's on my calendar today?" or "Add cereal to my shopping list." And, because this is a product from Amazon, you can — of course — also use Echo Show to shop with your voice. 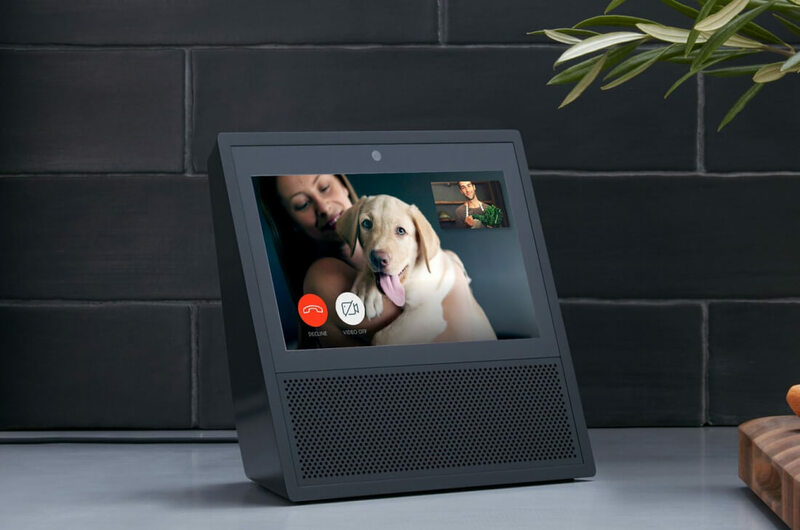 The device lets you video chat with other Echo Show users or anyone with the Alexa mobile app. You can also make regular voice calls to those with an Echo, Echo Dot, or the Alexa app. If your hands are full, no worries — you can answer or place a call with your voice. Echo Show also ushers in a new, somewhat creepy feature called "Drop In," which lets you "whitelist" your closest friends and family so they can initiate a video call with you whenever they'd like. According to USA Today, you'll have 10 seconds to reject the video call or opt for audio-only mode before it goes through. Fortunately, there's a "do not disturb" option, for those times you can't be bothered with unannounced virtual visitors. Amazon says Echo Show, which packs an Intel Atom x5-Z8350 processor, will play videos from its own Amazon Video service, plus YouTube, "movie trailers, and more." You can search for specific YouTube videos with your voice, and ask Alexa to play them for you. Whether the product will be able to play other streaming services like Netflix and Hulu is still in question. To make that happen, those streaming companies would have to create Alexa skills that work with Echo Show — something Amazon's hardware chief David Limp said is possible, according to Wired. One feature unique to Echo Show, compared to the rest of the Echo lineup, is its ability to display video from your smart home devices. It integrates with connected cameras from Ring and Arlo, so you can view their feeds on your Echo Show screen. Like other Echo devices, it will also let you control connected lights, thermostats, and smart home gadgets from brands like WeMo, Philips Hue, and ecobee — all with your voice. Below Echo Show's screen sit two Dolby-powered speakers, which pump out "incredible sound," according to Amazon. Amazon also crammed eight microphones into this thing, meaning it can hear your commands "from any direction — even while music is playing." Echo Show will stream Amazon Music, Spotify, iHeartRadio, Pandora, and TuneIn. It also supports Bluetooth, so you can stream music from your phone to the speaker, or from your Echo Show to a different speaker. When it comes to jamming out, Echo Show can do more than just play your music. It will display song lyrics on its screen as it's pumping the jams — perfect for your next kitchen karaoke session. Echo Show might look like a tablet, but it's not one. It runs Alexa skills, not apps, just like the Echo and Echo Dot. According to The Verge, you will not be able to download apps from the Amazon Appstore or Google Play on Echo Show. But with more than 10,000 Alexa skills now available, finding something for Echo Show to do won't be a problem. If you can't wait for Echo Show to hit the market toward the end of June, or find its price tag a little too steep, not to worry. Echo Show looks and acts a lot like a product that you can buy now: the Alexa-powered Nucleus Anywhere Intercom. The smart intercom also lets you place audio and video calls with your voice (and can do pretty much everything else Echo Show can), and is priced at $149, or $80.99 less than Amazon's version. Ready to outfit several rooms in your house with an Echo Show? Or do you want to buy one for yourself and someone you love? You're in luck: Amazon is offering $100 off when you buy two. To take advantage of the deal, add two Echo Show devices to your cart and use the code "SHOW2PACK" at checkout. Amazon says this is a "limited-time" offer, so if you already know you want a pair (or more) of Echo Show devices, be sure to grab the discount while it lasts. Angela Moscaritolo is a contributing writer at dealnews. Republished with permission.